Welcome to my contribution to Word-Filled Wednesday, hosted this week by Susan at Forever His. Be sure to stop by her blog for more visual inspiration from scripture. 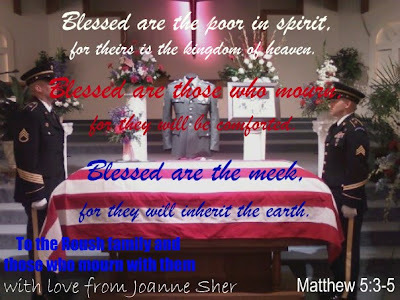 Yesterday, my church family, my community, and my country buried a hero. If you want to read more about it, check out my blog from Sunday. I barely (if at all) knew this man, but I know his parents, and his church family. This WFW is a gift to them, and to you. God bless this hero, and his dear family. That is so sad Joanne. God bless his family, friends, and church family. Thank you for sharing this tribute with us. My son is a US Marine, currently stateside and my husband's father died in Germany during WWII. The sacrifices our soldiers make to keep us free often go unnoticed. Thank you for remembering this family. I will pray for them during this difficult time. May we never forget to thank our soldiers (and their families) for all they do for us. May God comfort this family during their time of mourning. We have had 7 bodies come home today from a flying accident on route to the Kokoda Trail in Papua New Guinea. It was where our bravest soldiers fought off the Japanese in the war. It is horrific mountainous terrain and shocking to fly over. Our very bravest Missionary Aviation Fellowship pilots fly over these areas. So very appropriate. I'm just so sorry to read about another hero that has sacrificed his life for us. I'll be praying for this precious family now. I'm the mother a soldier too. Wow...that is beautiful and heart-warming. Thank you for sharing. May God comfort his family. What a high calling it is to serve now. Beautiful picture and Scripture. So touching. Having been following your blog on this moving story. A beautiful tribute friend. Again, thanks for sharing his story with us. I have been following your blog and praying for this family. What a beautiful tribute to them. My heart breaks knowing the pain they feel....what a sacrifice....and we are so thankful for those like him. Our soldiers are our heroes. It's sad when they are killed. I had a friend of my dad's killed in Vietnam and my husband's cousin, also. Our town in SLO was blessed that my friend's son came home after almost being killed in an accident in Iraq. He is the town's hero and he shares about his experiences and ALL that God showed him during that time. And I have a couple of other friends whose sons and daughters are deployed and we pray for them all the time. Yes, they are out their laying their lives on the line everyday and I thank them all for their sacrifice for our freedoms. Will be praying for your town hero and the family.